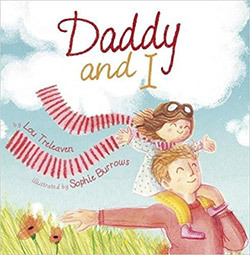 Daddy and I is a beautifully-produced book with bright, cheerful illustrations to complement the heartwarming message in the story itself. Sometimes, a child might feel anxious about a change of routine during, for example, a marital split, and they make seek reassurance that days spent with one parent at a time can be a positive thing. It is perfectly normal – and fun – to enjoy spending time with one parent independently of the other – for whatever reason. If at first a child is anxious about a different routine where the family is fragmented, then trying to find all the opportunities for fun in the new set-up is a positive message from this book. In the case of the child in this story, a day with Daddy is a very enjoyable experience. Whether simply getting away from a busy life and other siblings, or if the child lives apart from Dad, it reinforces the message that a day with a parent, one-to-one like this, is achievable. From the start to the end of this story, the child is having fun with Daddy! There’s so much to do, and the book sends out the message that Daddy’s Day can be a wonderful time, even without expensive outings and presents. A lovingly-written rhyme about all the fun a child can have, spending time with Daddy – just the two of them together. Ask the child to draw a story board, or a cartoon, illustrating their idea of a great day spent with one of their favourite adults. Where would they go? What would they see? Which foods would they eat?